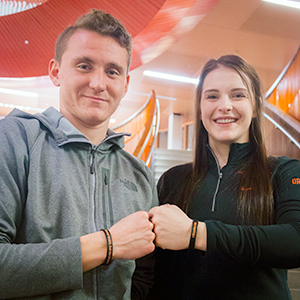 Within a year, former Oregon State gymnast and Kinesiology major Taylor Ricci and men’s soccer player and Finance major Nathan Braaten experienced the emotional turmoil of suicide when they lost a teammate. Through personal grief and frustration, the duo put their heads together to brainstorm ideas to bring mental health awareness out in the open. What was meant be a half-hour coffee meeting of the minds turned in to three hours of putting pen to paper and drafting an initial proposal for the #DamWorthIt campaign. Last October, Taylor and Nathan brought their 10-page document – complete with background, a vision and mission statement and a detailed campaign execution plan – to Athletics staff and received the buy-in and support they were seeking. Fast forward to last week when the campaign officially launched using Twitter as the platform. The pair has since received national media attention and recognition, including coverage in Sports Illustrated, The Washington Post and USA Today. Coincidentally, #DamWorthIt comes on the heels of Washington State quarterback Tyler Hilinski’s suicide. Taylor and Nathan were both saddened by the news and say it strengthens the argument of why mental health issues need to be discussed openly. Nathan says that in addition to the media coverage and support from Athletics and Counseling and Psychological Services (CAPS), they’ve received positive feedback and sentiments of gratitude and encouragement from numerous individuals, some of them sharing their personal struggles with mental health. Taylor and Nathan are waiting to hear if their 2018 NCAA Innovations in Research and Practice Grant Program submission has been approved. If it’s given the green light on February 15, #DamWorthIt will gain a huge boost and traction with $25,000 worth of funding. Nathan says they would use the funds to focus the campaign on three pillars – education, awareness/comfort and resources. The programming would be available to the Oregon State community ­– not just student-athletes – and would include Gatekeeper Training for Suicide Prevention, guest speakers, peer-to-peer wellness coaching, campaign promotional items and mindfulness classes. “If you openly talk about issues and struggles with mental health, it’s really a strength and a sign of mental toughness,” Taylor adds. Taylor is a student who knows firsthand what it’s like to have a full plate. While juggling a demanding athletics schedule including long practices and out-of-state travel for gymnastics meets, she’s kept up with the demands of a full-time academic load – and she shines. She earned a Pac-12 Leadership Award for 2016-17, is the NCAA Pac-12 Student-Athlete Advisory Committee representative and serves on Oregon State’s Athletic Strategic Planning Committee. Taylor aspires to attend medical school and would like to work in sports medicine. She says studying kinesiology was a natural fit, that the experiences she’s had in the CPHHS have been positive and enlightening and that mental health is most definitely a public health issue. Nathan and Taylor bring optimism and passion to their mental health campaign and have a simple mission as they continue forward. Taylor and Nathan acknowledge it can be hard to reach out – but that it’s #DamWorthIt. 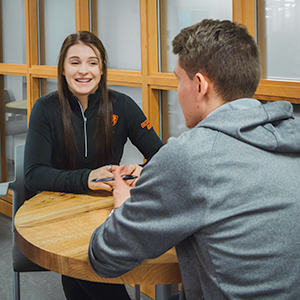 Mental health resources can be found through Oregon State’s CAPS program and the NCAA Sports Science Institute Mental Health website.